Kids have endless energy and love to learn new things. Satisfy their curiosity and sense of adventure as you explore the Edmonton area together. Here is a list of 100+ things to do with kids around Edmonton. Fuel up with coffee and breakfast wraps at the onsite Wild Earth Café and then let your little ones lead the way! Ride the merry go round, train, and paddle boats, or explore the many pathways of the Edmonton Valley Zoo as you say hello to all the animals! Children 2 and under visit for free. Get lost in the corn maze, visit the bunnies, pick strawberries or play in the pumpkin patch. Prairie Gardens is a 35 acre farm with countless activities the whole family can enjoy. Swing on the tire swing or play in the kid’s area. Children 2 and under visit for free. Over 100 different types of sea creatures call this aquarium home. Step into the underground passageways at Sea Life Caverns at to catch a glimpse of turtles, fish, sharks, sea lions, and reptiles. If you can’t get to the zoo, why not bring the animals to you? Perfect for gatherings and birthday parties, Thistle Hill Farm is one of the oldest licensed petting zoos in the Edmonton area. 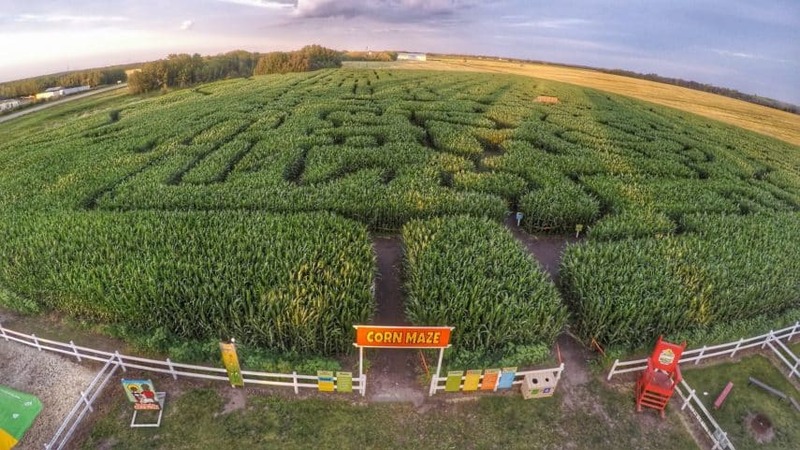 Get lost in a 15 acre field of corn as you work your way through the Edmonton Corn Maze from start to finish. Your kids can learn about bees, vegetables, plants and farming right in the heart of the city at Northlands Urban Farm. Bring the whole family for a tour or demonstration! Is there a budding equestrian in your family? Putting Horse Ranch offers riding lessons, trail rides, catered and buffet meals, grilled burgers and hotdogs, and golf! Spend a day in the field and fill your buckets with strawberries, raspberries and Saskatoon berries at Creekside Saskatoon Berry Farm. Visit the Vegreville Fair for a real country fair experience. There is a parade, kid’s tractor pulling competition, rides, games, fireworks, horses and more! Visit the greenhouse at Riverbend Gardens and learn all about how to take care of your garden, or let your little ones fill their buckets at the Saskatoon berry U-Pick. Spend a day in the sunshine picking your own fruits and vegetables, playing at the playground, jumping on the trampoline, visiting the animals or enjoying a scoop of ice cream at Happy Acres U-Pick. The Green and Gold Community Garden is a small organic working farm in the city. Visit the twice weekly markets to see the farm up close, and support a good cause: The proceeds from the markets go to charity. Pick your own apples, and say hello to the sheep that wander Sprout Farms Apple Orchard. You can press your own fresh juice with the apples you just picked, eat your lunch in the picnic area, or walk through the labyrinth. Pick your own strawberries, rhubarb, Saskatoon berries, raspberries and pumpkins and visit the chickens at Big Rock Berry Farm. Pick as many strawberries as you can at Strawberry Fields, and then let the strawberry eating begin! Take your little ones home to make strawberry shortcakes and jam. Inspire yourself and your preschooler at Tours for Tots, a weekly drop in program for 3-5 year olds and parents. Artists aged 6 and up can take part in weekly art camps at the Art Gallery of Alberta, and the whole family can come and play at the monthly All-Day Sundays event. What will your child learn today? Take your toddlers on a trip to Telus World of Science, where they can listen to a story, learn about dinosaurs, or pretend to be a scientist at the Exploration Station. Jump around on the Kinetic Dancefloor, or build something in The Workshop! Go for a ride on a real, old fashioned steam locomotive at Fort Edmonton Park, and explore the historical buildings. Take a carriage ride, bring a picnic lunch, or bring the whole family to Sunday brunch at Johnston’s Café. Kids today are tech savvy, have laptops, and know how to use social media. Make sure they have a strong understanding of where it all began and take them to see the Marshall McLuhan House and then grab a smoothie and cookie afterwards at nearby Mandolin Books. Tour a real, restored one room schoolhouse or a blacksmith shop at the Ukranian Cultural Heritage Village. The open air museum has 35 restored buildings for you to explore. The John Walter Museum is located in the heart of Edmonton’s river valley. Take a self-guided tour of the historical buildings, visit the pool and playground at the nearby Kinsmen Park, and pack a picnic lunch to eat under the trees. Visit the Alberta Aviation Museum on Sunday between 1 -2pm to take part in themed drop in programs. Your 2 to 6 year olds will love the stories, games, and the chance to see real airplanes up close! The Royal Alberta Museum is an engaging, family friendly place. Learn about Alberta’s rich history as you browse artifacts and photographs, or take part in programs designed for children and teens. Re-opening in 2018. Learn interesting facts about various plants from around the world and the climates they grow in, play games and do crafts at the Muttart Conservatory. The Alberta Railway Museum is a must visit place for anyone fascinated by trains! Ride in a steam locomotive, try on a real conductor’s hat, or tour over 75 real train cars and locomotives. Visit the Old Strathcona Farmers Market, then head out back to the High Level Bridge Streetcar station. You can ride the streetcar across the bridge to downtown and back. Kids 5 and under ride for free. Visit the Makerspace to try a 3D printer, make music in the sound booth, or turn your children’s drawings into their very own book at one of Edmonton’s Public Libraries! Bring your bathing suits and spend the day splashing around in the fountains and wading pools at the Alberta Legislature grounds. Snack on hot dogs from the food trucks, then head inside for a tour of the Borealis Art Gallery and Agora Interpretive Center. There’s even a giant Lego replica of the Legislature Building. Edmonton’s City Hall is an accessible and welcoming place for families of all ages. Splash around in the fountain and wading pool out front, and then head indoors to the gallery and interpretive exhibits. The Rutherford House was the home of the first Premier of Alberta. Now, this stately mansion is also houses the celebrated Vintage Fork restaurant and is surrounded by historical landscaped gardens and beautiful river alley views. Admire the 1929 Father Lacombe statue, visit the crypt where Father Lacombe and Bishop Grandin are buried and see the handcrafted adoring angels on the crypt, 3 Mission bells made in France in late 1800s, and take a guided tour through the chapel and the historic Mission Hill site. See the curvilinear landmark of St. Albert! Designed by the world famous architect, Douglas Cardinal, St Albert Place houses the ‘government (city hall) & the people (library, museums & art galleries)’. Visit the Musée Héritage Museum located in St. Albert Place to discover the history of St Albert, and learn how missionaries and Métis contributed to the development of St Albert. A reminiscent of Alberta’s golden agricultural past, these distinctive wooden structures that once dotted Alberta’s skyline teach valuable history lessons and about how a vibrant community grew around a grain elevator. Visit St Albert Grain Elevator Museum and Spruce Grove Grain Elevator Museum. Oil was discovered in Alberta in 1947, which shaped the growth of the province in years to come. Visit the Leduc Energy Discovery Center for the day, or spend the night in the campground! See a real oil rig up close, and take a guided or self-guided tour of the Museum. Children 5 and under can visit the museum for free. Your family can run around outside in the field at the Stony Plain and Parkland County Museum, check out a tractor up close, explore the restored historical buildings, and refuel with soups and sandwiches in the Tea House. Ride the carousel, roller coaster, or take a mini train ride through Galaxy Land at West Edmonton Mall. Children 2 and under ride the train for free! Feast on classic amusement park treats like popcorn and candy apples! Splash around in the wave pool, take surfing lesson, ride the zip line or float in a tube at the World Waterpark! Your family will love the extensive network of waterslides, and little kids can play in the specially designed toddler area. 2 and under play for free. Your family will love the chance to see the dinosaur bones up close at Jurassic Forest. Explore over two km of trails, dig for bones in the Paleontologist Playground, slide down the Tyrannosaurus slide, or visit the Interactive Learning Center. Children 2 and under play for free. Virtual reality, or pool tables? Arcade games, ping pong, bowling, axe throwing, and concerts! Recharge with pizza, salad and burgers in the Loft restaurant. You’ll need to come back to The Rec Room more than once to experience everything. Rain or shine, it’s always time for the halfpipe and kick flips! Bring your bike or your skateboard to the brand new Boneyard Skatepark. It’s indoors, so the equipment is always in great condition and ready to go! Splash around in the medieval themed splash park, or let them run wild on the extensive playground. There are volleyball courts, a skate park, and picnic areas at the Woodlands Water Playpark. Trampolines, dodgeball, an indoor jungle gym, arcades, and a restaurant. You can your little ones can spend all day rain or shine at the Indoor Fun Park Amusement Center. Switch off that cell phone and spend a day or a few hours at Edmonton’s swanky rec centres like Claireview. Photo Credit: Sun Aura parks Inc. Enjoy a bright summer day with your friends aboard a pedal boat. Pedal boats are available for rent at Hawrelak ( 9930 Groat Rd NW) and Rundle (2909 113 Ave NW) parks from late spring to end of summer. Bring your children to Bricks 4 Kidz, where they can tap into their creativity and play with Lego in ways they’ve never dreamed of! Perfect for birthday parties, afterschool, and drop ins. Parents: There’s even a special drop off evening class if you’d like a night out! Visit the beautiful man-made Broadmoor Lake Park complete with a walking bridge, boardwalk, fountains and playground. Bring your racquets and balls to the outdoor tennis courts, or head to the ball field. Walk through 10 kms of trails and under huge trees, or play on the playground at Borden Park. The park is also home to fountains, and numerous works of public art. Look for the giant, rainbow willow sculpture! Waterslides, floating rafts, lazy rivers, and wave pools. Edmonton has a number of indoor pools where you can splash all day long, including Millenium Place, Clareview Recreation Center, Terwillegar Recreation Center, Commonwealth Recreation Center, Leduc Recreation Center, and Kinsmen Leisure Center. Feed the ducks in the small lake, and pack a picnic so you can spend the day at Jackie Parker Park. There is a splash park, pavilion, a climbing wall, and fire rings where you can light a fire and roast marshmallows. If the weather is nice, stay outside to play on the impressive Kinsmen Grizzly Bear Lodge Park. Pack a picnic and spend the day at the Queen Elizabeth Pool and Spray Park! If it’s raining, you can head indoors to the indoor playground, and kids can even ride their bikes inside on Tuesdays and Thursdays. Your little kids (and big kids!) will want to spend all day at the huge spray park! If they get tired of splashing around, stop for a picnic, then visit the skate park and playground and pirate ship structure at Castle Downs Park. An accessible park without sand, Brintnell Park is great for bigger kids, but especially great for toddlers, with a huge toddler play area. Climb the hill and have a picnic lunch on the mushroom shaped tables, splash around in the splash park, or let your kid’s burn of their extra energy climbing all over Boonie Doon Park. Your kids can climb the walls, literally! Bring them to Vertically Inclined where they can burn off some extra energy as they pull themselves up the rock climbing walls! Do your kids have skateboards, bikes or scooters? Bring them to the outdoor Capilano Skatepark, Millwoods Skatepark or the St. Albert Skatepark where they can be dazzled and inspired by older kids tricks, and try a few of their own! Chase your kids (or let them chase each other!) around glowing, black light reflective walls at Laser City Laser Tag, Gateway Entertainment Center, and Laser Quest. Your family and friends will love the chance to get together, talk, laugh, and eat yummy snacks while trying to knock down the pins at Bonnie Doon Bowling Lanes, Plaza Bowling Co., Gateway Entertainment Center, Ed’s Bowling, Sherwood Bowl, The Rec Room. Kids can walk across the balance beam, try hula hoops, bounce on the trampolines, or wave ribbons through the air! Little ones can try drop in gymnastics at Ortona Gymnastics, Phoenix Gymnastics, Salto Gymnastics, St. Albert Gymnastics, and Champions Gymnastics. Keep those kids happy and moving, and let them dance! 3 to 7 year olds can try the Happy Feet program at Dance Code Studio. Two year olds can get moving in the parent and tot Dynamic Dance class, and 3-4 year olds can explore movement and imagination in Footlights and Fancy Feet. Every Friday from 11am to 12pm, the park is open just for Parents and Tots at Jump 360 Trampoline Park. Children 3 and under jump for free. Let your preschoolers jump and play at Launch Pad Trampoline Park, in the play area specifically designed for 2-5 year olds, featuring a trampolines, a foam pit, interactive games and building blocks! Drop into the University of Alberta’s Astronomical Observatory for the chance to look through their special telescopes. Have an up close look at the sun during 12-1, or visit in the evenings to see the moon and stars! Visits are free to the public. Ask for the children’s map when you arrive, kids will love the castle, hedge maze, the giant bell, and the café serving ice cream at the Devonian Botanic Garden. Drop-in to participate in John Janzens Backyard, an immersive drop in program of games, educational projects, and outdoor exploring! Visit the John Janzen Nature Center on weekends and take part in the daily 2 pm guided walk on the trails around the nature center. The Waskahegan Trail will be too long for your little ones to complete, but it’s the perfect way to escape back to nature and let your little ones run wild. Pack a picnic lunch and a group of your favorite friends and discover some new paths together! Take your family kayaking, canoeing, or hike on the trails. With two huge playgrounds, a sandy beach for building sandcastles, and numerous playgrounds, you’ll want to spend the whole day, or several at Elk Island National Park. Enjoy the displays of roses, lilacs, daylilies, Asiatic lilies, peonies, and lilacs in this five acre botanical garden. Bike, hike or run, but be sure to explore this beautiful multi-use trail system with over 85 kilometres of recreational trails, of which 34 km of paved multi-use trails connects major recreational parks of St. Albert. Strathcona Science Center Park is a beautiful park is right on the North Saskatchawan River, and is perfect for hiking, picnicking, and bird watching. Bring your binoculars when you visit the Larch Sanctuary. This important nature preserve in the heart of the city is home to many species of birds, ducks, wildlife and plants. Fill your backpack with snacks and explore the nature preserve around Cooking Lake. Bike, canoe, kayak, or hike the trails and look for interesting birds and plants! Explore interpretative boardwalk built on the marsh next to Big Lake. A perfect family hands-on wetland education destination: see a variety of variety of birds, mammals, plants, and insects. Hawrelak Park is a natural oasis in the heart of Edmonton. Feed the ducks and geese and then take the paddle boats for a ride around the pond, or grill sausages on a fire pit as you enjoy a picnic lunch, and then let your kids run around on the playground. Rundle Park has several ponds, trails, mini golf and sports fields, and a playground that will satisfy kids of all ages. Take a canoe or paddle boat ride around the canals and ponds, or take your family for a canoe lesson if you’ve never tried it before. Whitemud Park has an extensive network of natural, forested trails along the ravine, perfect for hiking in the center of the city. It’s attached to the Alfred H Savage Center, with washrooms and rooms available for the public to rent for gatherings and parties. Wander over the many foot bridges and trestle bridge that crisscross the Millcreek Ravine. This beautiful, naturally forested ravine in the heart of the city is full of hidden fields, bike paths, rock beaches and picnic areas. Visit Alberta Beach, on the banks of Lac St. Anne and spend the day basking in the sun, paddling in the water, or stopping into local eateries for a delicious lunch. Bring your boat, bathing suit and sand toys to splash around the Wabamun Lakefront Park. Edmonton’s infamous and temporary Accidental Beach formed in the summer of 2017 when piles in the water caused a sand bar to form along the banks of the river valley, near Clover Dale neighbourhood. Walk along the beach overlooking downtown, and build a sandcastle! Older kids (must be 5 and up) can tube with their parents on the majestic Pembina River. Pembina River Tubing will provide the tubes and lifejackets which must be worn at all times. Bring a racquet and ball and practice hitting it over the net, no score keeping required! Edmonton has a number of indoor and outdoor tennis courts to enjoy, such as the Coronation Tennis Courts and the Kinsmen Sports Center. Take a drive out to beautiful Parkland County and spend the day tubing, fishing, horseback riding, and playing paintball! Take your kids to the water and visit one of many nearby lakes such as Beaumaris Lake, Pigeon Lake, Sylvan Lake or Crimson Lake. Your little ones can run wild in one of Alberta’s numerous and spectacular provincial parks. Visit for the day, or bring a tent and stay for the week! Edmonton is known as festival city, and there is no shortage of special events to attend! Don’t miss Folk Fest, Kaleido Family Arts Festival, the International Children’s Festival of the Arts, Fringe Fest, K-Days, Heart of the City Festival, Freewill Shakespeare Festival, and Servus Heritage Festival. Exploring and enjoying the markets and local artists is a fun way to give inspiration to your budding artist! On the first Thursday of every month from May to September, the Perron district turns into a vibrant outdoor art gallery with refreshments and entertainment. Bring your whole family to the St. Albert Artwalk and spend the evening discovering local galleries and new artists. The annual Strathearn Artwalk is located in the huge field in Strathearn Park, overlooking downtown Edmonton and the river valley. Grab a coffee or locally made treat as you browse artworks from over 200 artists. Watch live music and dance demonstrations, visit the children’s area, or have lunch in the beer gardens. For one weekend a year, the already vibrant neighbourhood of Old Strathcona is transformed into the three day long Whyte Ave Artwalk. Discover hundreds of artists, visit the Old Strathcona Farmers Market, and pop into local shops and cafes for lunch as you explore the area. Introduce your kids to great music by taking part in one of the parent and tot classes at the Winspear Center, or catch a family friendly symphony show! Citadel Theatre: The Citadel Theater is a beautiful theater located in downtown Edmonton, complete with an indoor waterfall, ponds, palm trees and a pirate ship. Visit to explore the gardens, take a theater class or catch a family friendly show! Arden Theater: Catch a showing of various family themed theatre and live shows at Arden Theatre by St Albert Chrildren’s Theatre or by travelling artists! Festival Place Theater: Festival Place Theatre is another great place to watch family fun shows especially during long weekends! Do not forget catch a family oriented ballet by Alberta Ballet! Every summer, the city of Edmonton presents Movies on the Square. Bring your lawn chairs, popcorn and blankets to Churchill square for an authentic outdoor movie experience on a huge three story screen! Snacks are available to purchase and washrooms are on site. Visit Garneau Theater for a real, old fashioned family movie experience including a photo booth or monthly family favorite’s movie showings at Cineplex Odeon. Never mind the stairs, you and your little ones can ride down the hill behind the Fairmont MacDonald in Edmonton’s brand new, glass walled Funicular! Ride for free and then walk to the river valley lookout. Kids and Cafes don’t always go together, but the Woodrack Café, Juniper Café, The Nook Cafe, and Café 0’Play are all ready to welcome children, any time of day! Let your little ones choose a special old fashioned treat at a real sweet shop. Be-a-Bella in Highlands has a beautiful assortment of classic toys, gifts and candy, and Gummi Boutique specializes in hard to get candy flavours. Take an old time family photo at the Antique Photo Parlour in West Edmonton Mall, complete with Victorian costumes and hats. Head to the brand new Roger’s Place arena for a hockey game, ice skating show, or concert! Visit Clay and Cupcakes for the monthly Mommy/Daddy and Me class, and paint a handprint or footprint keepsake to take home with you or paint a piggy bank at Crankpots Ceramic Studios. Thinking of making an art project out of recycled items? Plan a visit to the Reuse Center. For $5 you can walk away with as many items as you can take with you, like fabric, yarn, boxes, vases, ribbon, paper and cardboard. Kids 6 and up can take part in classes and workshops. Does your little one like to craft? For $2, your little one can participate in a 30 min crafting lesson at Michaels while you browse the store. Head to the nearest Home Depot on the second Saturday of each month. Children 5-12 can practice their woodworking and hammering skills with new projects! Be sure to sign up in advance. Your little ones can practice their hand eye coordination as they play mini golf at Dragons Tale Blacklight Mini Golf or Monster Mini Golf. Experience farm direct produce, fresh fruit, locally handcrafted art, popcorn, live music, and food samples at the Old Strathcona Farmers Market, Callingwood Farmers Market, or the City Market Downtown. Churchill Square is a hub of activities all year long. In warmer months, play the giant cheese game, ping pong, or drop in for a free family friendly outdoor Zumba class.